The Annual General Meeting and film showing of “High Water Common Ground” on Thursday 12th April at 7.00pm at The Waterfront Hall, Hebden Bridge Town Hall, Hebden Bridge. Directions here. On Thursday 12th April, Slow The Flow: Calderdale will be holding its first public meeting of 2018 which will consist of its AGM followed by a showing of “High Water Common Ground”, a film about flooding and what we can do now to reduce the risk of flooding here and throughout the UK… made by filmmaker Andy Clark. Slow The Flow: Calderdale have had an amazing year. Well over 100 volunteers have installed nearly 150 leaky woody dams at Hardcastle Crags and have also raised over £15,000 including donations from the Yorkshire Tough Mudder event in July. The SWIG Award for the “Best Project in 2017” and the Calderdale Community Foundation “Great & Green” Award. Slow The Flow: Calderdale are currently in negotiation to secure further funding to develop more sites in Calderdale to install leaky woody dams and other attenuation schemes. 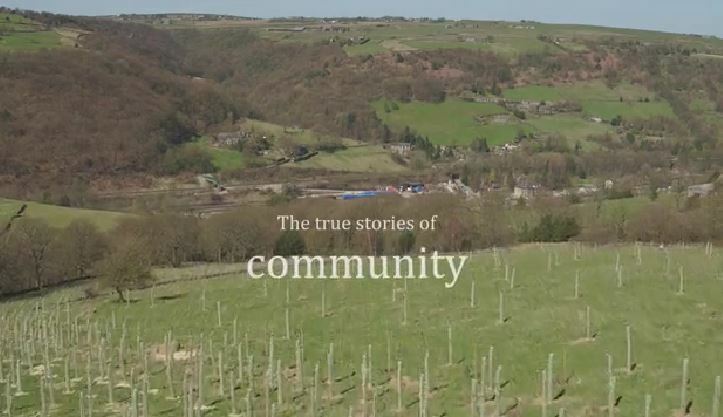 Please come and help Slow The Flow: Calderdale celebrate their achievements and also see an exclusive screening of the amazing film “High Water Common Ground”. 7.00 pm – Welcomes and introductions. Financial report and election of officers. 7.30 pm – Overview of Slow The Flow projects carried out in 2017 and plans & projects for 2018. 9.15 pm – Questions & AOB. 9.30 pm – Finish and retire to the pub. Refreshments will be provided. We look forward to seeing you at 7pm on Thursday 12th April at Hebden Bridge Town Hall. Please register here to reserve your FREE place. Slow The Flow on National Trust Hardcastle Crags website.